Don’t get me wrong…I still love every summer day. I just want to hold onto Summer so much. It’s my season, when I am my best self. June is a new beginning, a giant sigh of relief. It’s full of opportunity and wonder, like January 1 kicks off every year. Anything is possible. It’s refreshing and reassuring. It’s also deceiving, leading us on to believe that there’s plenty of time to get our summer “to do” and “to enjoy” lists completed. As July wanes into August, things change again, ever so subtly. Each day is now filled with a little more urgency. Sunsets get earlier as the sun’s early evening slant changes its angle and becomes less intense day by day. Many of the bright summer flowers have lost their blooms, and nights become slightly cooler by the week. I look back at June and July, and wonder where the hell those days went. I then look ahead at what’s still on my summer goal lists, removing a few because there’s no longer enough time to accomplish everything I had hoped to do. The lone cricket’s serenade that woke me early this morning affirmed that yes, it is indeed August already. Let’s live in the present and forget our lists. Let’s turn off our notifications and stop being a slave to technology. Let’s hold onto each moment, to each day, to each experience. Let’s notice the breeze blowing through our hair and feel the rain on our skin. Let’s put our feet in the salt water and find eternity in the waves. Let’s savor the ice cream cone, the watermelon, the corn on the cob, the peaches and plums. Let’s laugh and sing with family and friends. Let’s be grateful for all that we have, for all that we are, for all that we do, and for all in our lives. Let’s face each day without worry, without fear, and without strings attached. Let’s soak up every single second of August without leaving any wasted time behind. Anyway, especially at the end of Inside Out, when Joy realizes she needs Sadness…man, I’m a blubbering idiot watching Riley cry because she’s been trying to put a positive face on for her parents but is really sad about moving. It’s in that moment that Joy realizes that her favorite core memory from Riley’s life is also Sadness’ but for different reasons. Joy and Sadness need each other to work, as do Anger, Disgust, and Fear. Who’s your friend who likes to play? Bing Bong realizes they are too heavy to make it to the top of the cavern, and on the last attempt, he jumps off and Joy soars forward in the rocket. Joy looks back as she clears the dump, and Bing Bong waves as he slowly disappears, which symbolizes Riley maturing to a point where she’ll forget her childhood imaginary friend. Cue the crying. Holy crap, I’m a mess. I remember that time in my life, teetering between childhood and young personhood but not quite ready to leap forward, with one particular memory crystal clear in my mind’s eye. I was swinging on the swing set in my back yard, somewhere around 9 or 10 years old, and I knew I wasn’t a kid anymore but I didn’t want to grow up just yet. I cried so hard in that moment, and even though it was so long ago, it feels like it was yesterday. Without children of my own, it’s harder for me to relate to such a lesson as a parent. I imagine the parents reading this can recall not only a similar moment in their own lives when they were faced with having to forge ahead into young personhood from childhood, but the moments when their children made that leap as well. I did, however, experience a small episode of a disappearing Bing Bong last week. While at the boardwalk with my two nephews, the six-year-old H wanted to go on the ride with the boats. As he walked up to hand his ticket card, the ride attendant pointed at the sign indicating the maximum height of riders, and H was a smidge too tall to go on the ride. This was the first time he was too big for any of the rides. He looked at me with a quivering lip and tear-filled eyes, then ran over to me and hugged me tight as he let those tears out. And I let him cry it out while I held him tight, crying inside myself but trying to keep a strong exterior so that I didn’t further upset him or his brother. Within a minute, he regrouped and we moved on to ride the balloon Ferris wheel ride, where all three of us were the acceptable height. This two-minute long experience made me realize that it’s got to be so much harder for parents watching their own children cross that threshold from childhood to young personhood. My sympathies are truly with you. Watching Bing Bong dissolve a day later brought that look of sadness on H’s face flooding back to memory. I cried a little harder at this part in the movie this time because I thought of H and how his own personal Bing Bong was a tad less clear than it had been earlier in the month. That’s the sucky part about maturing and growing up. Life has its stages and it’s all part of our plan, but knowing that doesn’t make it any easier. H is growing up, as we all do, and it’s not easy. What I can do for H is to be there ready with hugs and understanding whenever he needs me. That goes for all of my nieces and nephews. Yesterday, I took my very own pinwheel out of my shed and let it blow in the breeze. Then I bounced my purple ball on the sidewalk a few times. I blew some bubbles into the air and spun around. I hugged my Mickey Mouse, Pusheen cat, Boba Fett, dinosaur, and tiger stuffed toys, then stacked a few of my Tsum Tsum figures in new formations. Earlier today, I received a text from my sister-in-law with a picture of a rare, new Tsum Tsum figure the boys got in a blind bag. They were both excited to show it to me. And I was even more excited to know they finally got their three peas in a pod. My own, personal Bing Bong is as clear and as bright and as alive as he ever was. It’s summertime, and the living is fine, for sure. Morning walks along the boardwalk and the beach, sitting in the shade and writing, watching the hundreds of birds at the feeders, enjoying an ice cream cone or a treat from the ice cream man, lunches and dinners with friends, picking green beans from the garden, wandering downtown, fishing with my husband, laughing with my nieces and nephews…life has been simply beautiful. It helps that I’m feeling extraordinarily better than last year at this time. I am once again an active participant in life with an awareness of my limits. I’m doing my best to savor each of my experiences and celebrate the ordinary moments in my days. Feeling better physically has led to a more positive mental and emotional outlook as well, and I can’t remember a time when I ever felt this content. I said yes to an opportunity on a Facebook status months ago, and it turned out to be a fantastic time with friends and classmates as we saw the Violent Femmes in Asbury Park. Random, spontaneous fun for sure as the gents of the Femmes rocked the house. What a great time with even greater people! But isn’t that the point of life? Shouldn’t we be doing all we can to enjoy every moment of our time here on Earth? Yes. Definitely YES. And I will be saying YES to life from this point on. In other news, my novel is taking shape. I can see the storyline now, and what helped me get to this point was creating two large plot boards. I color coded events, themes, and symbols and arranged them in the order I want to include them on large, styrofoam-type poster board. It’s easier for me to look at it all at once, versus paging through a notebook to find the right note. Now everything is right there in front of me. The novel is going to be in three parts, and I’m almost done with Part One. My goal is to finish Part Two before I go to Dublin in the middle of August, then write most of Part Three after I return because that part takes place in Dublin. While there, I plan to visit some locations and look through the eyes of the main character so I can accurately write about it. I’ve been writing every day and am plugging along as I tell the story of Kelly Lynch and how her friend, Shannon, led her to her true purpose in life. I’m also going to be setting up an author webpage with it’s own blog that will track my progress. Once that’s set up, I’ll be promoting it here and then you can follow me on that avenue if you’d like. If you are looking for a great book to read this summer, consider Liz Nugent’s Unraveling Oliver. I had the opportunity of briefly meeting Liz at BookCon in June, where I received an advance copy. Set in Dublin, the novel develops the story of Oliver Ryan and is full of suspense. Talk about signs…when I started reading it, I had no idea it was set in Dublin, or that Liz Nugent hails from Ireland. I couldn’t put it down! It’s going to be released later this summer here in the USA. I highly recommend Unraveling Oliver. Have a splendid day, and thanks for being a part of my journey. What’s There To Be Afraid Of, Anyway? I woke up this morning to my phone vibrating like crazy with a slew of severe thunderstorm alerts. I used to be very afraid of thunderstorms until two years ago when I was at a local amusement with my nephew, then 10, and some terrible storms came through. We were standing outside under an awning, and he was a little uneasy about the situation. I couldn’t let on that, inside, I was curling up in the fetal position with my fingers in my ears because I didn’t want to further freak him out. So I pretended that the storms didn’t bother me. I remained calm on the outside despite hearing the sizzle of lightning and the crack of the thunder close at hand. I pointed out different things to look at, like the family dancing in the rain and the people who would run past at top speed every two minutes. We both laughed as we tried to predict when the next person would come screaming through with a bag over their head and shoes in their hand. Within a few minutes, the worst of it passed us and we ended up having a stellar time because almost everyone else left the park. The rides were ours and ours alone for the remainder of the night. I learned two valuable lessons that day. One was to sing and laugh in the rain, and I wrote a post about that lesson in January 2016 (click anywhere in this sentence to read it). The other was that there was nothing to be afraid of. I couldn’t control the lightning or the thunder, so why had I let the thunder and the lightning control me? What was there, really, to be afraid of? The lighting and the thunder would do what it does, regardless of how I feel about it. Could I ever, truly, prevent the worst from happening? So when I woke up to the alerts this morning, I didn’t retreat to the floor in the fetal position with my fingers in my ears covered by a blanket. Instead, I opened the blinds and watched the water pummel down from the clouds, making little waterfalls on the trees and the leaves and the neighbor’s roof. There was no thunder and no lightning, but if there was, I would have watched it instead of hiding from it. Now, let’s take that a step further. If I look at other things I’m afraid of with the same logic, why do I let fear run the show? What’s the worst that could happen if, say, I got on that big roller coaster? Or better yet, what’s the worst that could happen if I took a chance on my writing and stopped using fear as an excuse? I was afraid of thunder and lightning for almost 44 years. Did the worst ever happen? If I take a chance and get on that roller coaster, I’m 99.9% sure the worst isn’t going to happen. And as a wise friend once said, I can do anything for a minute and a half. I think it’s time to consider getting on that roller coaster ride. And it’s time to move forward with my novel. I’ve wasted enough time because I’m afraid I’m not taking the right path with the story line. I’ve just got to trust the path that I choose to take for my characters and go with it, regardless of my trepidation. What’s the worst that could happen if it’s not the right path? I’ll simply just start over again. I have always remembered the reason for Memorial Day and Memorial Day weekend and have honored it by remembering those lost, going to a ceremony or two, putting flags in my yard, wearing red, white, and blue, or raising awareness through my writing. For me, the true meaning hit home twice, in 2010 and 2011, when two very special young men who spent time in my classroom paid the ultimate sacrifice, each with immense courage and bravery. One is Sergeant Ronald A. Kubik, Army Ranger, and the other is Lance Corporal Nicholas S. Ott, United States Marine Corps. On Friday, I taught my current journalism and English 11 students about these two heroes who sat in the same seats as them at some point in their lives. It’s important to me to keep Ron and Nick’s legacies alive with the hope that today’s generation can learn from them and possibly emulate something from each of their examples in their own lives. I am now toying with the idea of writing a curriculum unit for other teachers to use in their classrooms, not just necessarily focusing on Nick and Ron but on other New Jersey heroes lost in all conflicts. Below is a letter to Ron and Nick that I originally wrote and posted in 2015. I updated it for 2017 as my thanks and tribute to both of them on this Memorial Day. It’s been 15 and 13 years, respectively, that you were students in my English class. You both sat at a desk for 180 days, Ron during 9th grade and Nick during 11th grade, and spent 50 minutes every day writing, reading, learning vocabulary, completing assignments, and earning your grade. And during those 180 days, each of you made a lasting impact and taught lessons to someone who was supposed to be teaching you. Ron, I will never forget how you read “Of Mice and Men” aloud in your best British accent, yet you read your part in “A Midsummer’s Night Dream” with a thick, southern accent. Laughter, that’s what I remember. Pure laughter. I remember you enjoyed writing, but as a freshman, you didn’t want to admit it. How I wish I kept some of your essays and reflections, for they were good…much better than a typical 9th grader’s writing. I remember your pride in your hometown, your blue mohawk, and your incredible effort on the football field, playing each game like it was the super bowl. It wasn’t the same when you moved away, and there was a huge hole of missing spirit that couldn’t be filled by anyone else. I am aware of the legacy you left at Manasquan High School and how you are still an inspiration in that building. Through the magic of social media, we caught up after you graduated and I enjoyed seeing the pictures of you in your band, and then as an Army Ranger. I am sure the United States Army immediately knew that they were getting one of the best of the best. I know that you absolutely loved it when some of my students called you a badass merely from my verbal description of you. Then when they saw your pictures? Yeah. You loved every minute of their reactions and are still basking in that glow. Nick, your smile and your work ethic are what I most remember about you. No matter what it was you were doing, you always your best…in the classroom, on the field, on the stage…and you never, ever complained. More often than not, you surprised even yourself by doing better than you ever expected, even though at times you weren’t a fan of what we were studying. And that smile…that big, wonderful smile, with that impish spirit behind it…there’s no other smile like it. I fondly remember your part in The Varsity Lettermen’s TWO acts for Hawkapalooza, working hard to perfect each routine, and selecting that perfect dress for your costume, the powder blue shift with the rhinestone broach. That moment of greatness and sheer joy has never been matched on the Hawkapalooza stage since, except maybe the secret, surprise return of The Varsity Letterman the following year. One of the best days in my life was the last time I saw you, when you were home on leave and stopped by the school for a visit after classes let out. I was having an extremely bad day and wanted nothing more than to go home, and I got a call from the main office that someone was here to see me. That was the last thing I wanted, but my anguish was quickly replaced with excitement and happiness as I saw you round the corner of the hallway with that smile beaming as you walked down to my classroom. We spent about 90 minutes catching up and talking, and those are the best 90 minutes I ever spent in my life. While I don’t have a photograph of that moment, the picture in my mind’s eye is crystal clear, like it happened yesterday. Words cannot express the extreme heartache and sadness that I, along with so many others, felt upon hearing the news that each of you had passed away. In fact, I remember exactly where I was standing when I got the news about each of you. Yet, upon learning that so many others were saved because of each of your actions, I had two new heroes to look up to for the rest of my life. Not a day goes by when I do not think of both of you. Several times every year, but especially on Memorial Day and Veterans Day, I share your stories with my students who sit in the same desks that you did…stories of heroism, of bravery, and of courage. Thank you, Nick and Ron, for your lessons, for your sacrifice, and for leaving footprints along my life’s journey that can never be erased. I will do my best to continue sharing your legacies and your stories for as long as I can. With my utmost admiration, gratitude, honor, and respect. Not everyone has a connection to someone to honor on Memorial Day. If you don’t, please visit my links below so you can learn more about Sgt. 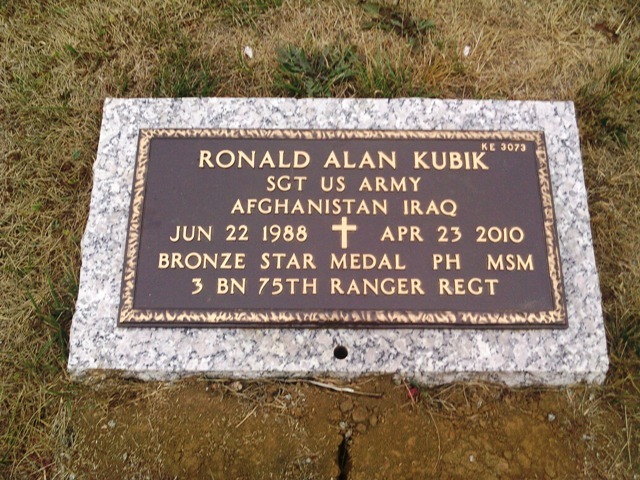 Ronald A. Kubik and Cpl. Nicholas S. Ott. You can also pick someone to learn about by visiting the NJ Run for the Fallen Honor Wall and the New Jersey Vietnam Veterans Memorial & Museum Wall of Faces. Regardless of your politics, I urge you to take a moment this weekend to honor what the day means and stands for. Educate the young people in your life about the true meaning of Memorial Day and about real heroes like Nick and Ron and the thousands of others who gave their lives for the United States of America. Attend a local ceremony or service for an hour, and/or join in the National Moment of Silence at 3 PM Tomorrow. Thank you to all the men and women who gave their lives while serving our country. I am grateful for your sacrifice and I honor your memory. To learn more about the Corporal Nicholas S. Ott Memorial Fund, click here. To learn more about the Sgt. Ronald A. Kubik Scholarship, click here.